You made me smile! | Brae. A gay woman's tale! 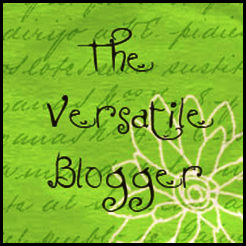 I had a message from http://amediablogger.wordpress.com this morning with “A Versatile Blogger” award! I am a bit surprised .. my blog is mainly an outpouring of my thoughts, my mood and sometimes a bit of humour .. but I am so grateful that someone somewhere thinks that my blog helps make their day! I am up to my ears in work today … setting up a new business takes time .. and patience (what the heck is that?) … so I had better get on and do more work .. but I will look forward to having a good old think later about who I can pass the same award onto …. Hey CJ, thanks for the post. I am glad I made you smile, your posts are brilliant – ramblings or not! Have a great day, Maria. Well done Ceej. The thing is, well, things are… You write every day (something I can’t do with my own blog); you have a lightness of style; you have wit; and your genuine decency, empathy, and understanding shines through your blog. These reasons (amongst others), are I should imagine, why others enjoy your *ramblings*; why you deserve this recognition; and why you will be very successful in your new role as a celebrant. Now, if you quote me on this……. I shall have to deny it or my reputation will be in ruins!